California courts, like the courts in all states, have the power to issue orders to the parties in a lawsuit, including parties to a divorce. Willful violation of a court order is an offense known as “contempt of court.” California courts may issue various orders with respect to a divorce proceeding, including orders compelling all parties to comply with the court’s previous directives. Because contempt of court carries a potential penalty of imprisonment, not all legal obligations are subject to court orders enforceable by contempt of court. A routine money judgment, for example, cannot be enforced by contempt of court sanctions because the Constitution bans imprisonment for debt. A number of divorce-related issues that involve the payment of money or relinquishment of assets can be enforced by contempt of court sanctions, however. A court may impose contempt penalties for failure to comply with an order for child support; failure to pay court costs; failure to pay the other spouse's attorneys' fees; failure to comply with the court-ordered division of marital property between spouses; failure to honor court-ordered assignment of marital debts; and in some cases, failure to comply with a marital settlement agreement. Other types of divorce-related issues enforceable by contempt of court penalties include orders regarding child custody and visitation, restraining orders and financial disclosure requirements. 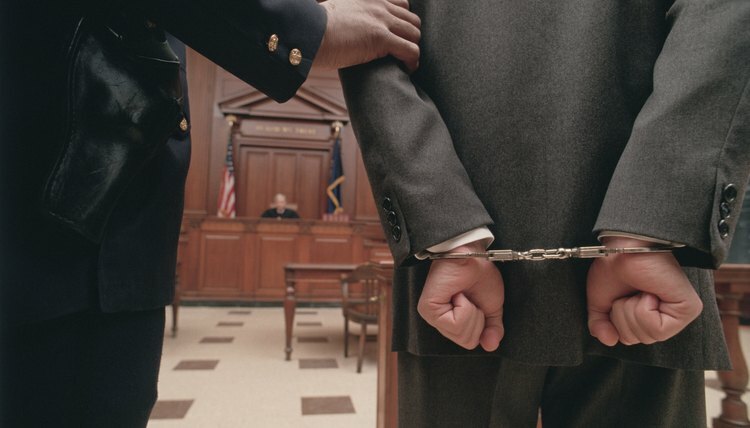 A successful prosecution for contempt of court requires that the defendant willfully disobey a court order of which he was aware and capable of complying with. The defendant may assert numerous defenses under California law. Defenses include an assertion that failure to comply was unintentional, the defendant didn't know about the court order (for example, he didn't attend the hearing and his attorney failed to inform him), he lacked the ability to comply with the order, or the assertion of noncompliance is false. To initiate a prosecution for contempt of court, the aggrieved party must file an Order to Show Cause and Affidavit for Contempt (Family Law) with the family law court that issued the relevant order. These forms are available on the California Courts website. The affidavit must be personally served on the defendant. The family court will convene a hearing, and divorce proceedings will be suspended until the contempt charge is resolved. The defendant is entitled to attend the hearing and to be represented by an attorney. Because of potential criminal liability, he is entitled to criminal law protections under the Constitution, such as the right to remain silent to avoid self-incrimination. Guilt must be established beyond a reasonable doubt rather than by a mere "preponderance of evidence," a lower standard of proof that applies to civil proceedings. Penalties for contempt of court include up to five days in jail for each count. This can add up quickly – for example, each month for which a defendant fails to pay child support can be treated as a separate count. Alternatively, the court may sentence a defendant to up to 120 hours of community service per count. Repeat offenders can be sanctioned by up to 10 days in jail or 240 hours of community service per count. If the conviction for contempt resulted from the defendant's failure to perform an act that he is still able to perform, the court may simply order him imprisoned until he performs it. In California, the statute of limitations for contempt is two years after the act or omission that constituted the contempt occurred. Unlike a corporation, which must have a board of directors, the members of an LLC are free to determine how an LLC will be structured and operated through executing an operating agreement. In California, an LLC member who breaches an LLC operating agreement is liable to the LLC for any economic consequences resulting from the breach. A power of attorney is a legal status given to an agent by a principal. Under a power of attorney, an agent is able to engage in legally binding conduct on behalf of the principal including buying and selling real estate, making investments, managing assets or entering into contracts. If the agent takes advantage of his power of attorney, he could face civil penalties including restitution of lost money or a judgment for damages and fees. Conduct amounting to a crime could result in incarceration or significant criminal fines.